Food Storage Recipes and Food Storage Videos: Seasonings Greetings! For each pound of ground beef/turkey, use 2 tablespoons of this seasoning, plus ¾ cup water. Method: Combine spices, mix well, and transfer to a spice container. Label with instructions for use, and plan your next taco night! Use this seasoning mix as a dry rub for chicken, or simply sprinkle it on dishes for some creole flare! Method: Mix together herbs and spices and transfer to a shaker-top container. Avoid touching your face after handling these spices, or you’ll likely shed a few tears. 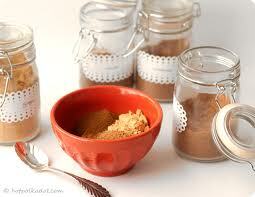 Blend all together and store in airtight container.